I looked around the internet for it and couldn't find it on anything like google. Next I tried youtube, and I think TheDarkLena got gloves. The icon for the gloves was a red triangle instead of a purple square. When you try to identify it, it says "You can feel a strong power that cannot be identified yet. (Can be identified later.)" What do you guys think? New end-game equipment? Inb4 better than Heroic sets and everyone complains about having to change their setups again. I'm also questioning the red "cannot dismiss." 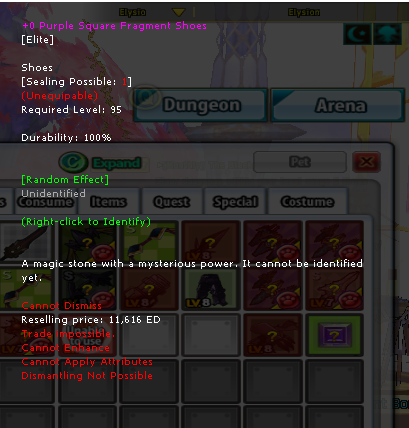 From my three+ years of Elsword experience, I don't remember seeing any item with that text. TFW your mind instantly goes to Kill la Kill, lol(I only watched one episode, I swear). You know who's better than you? I haven't watch one episode of Kill la Kill cuz reasons. Well legendary armor was confirmed in a GM stream so that's what I would speculate those things are for. Maybe its like SD gear where u get pieces in random dungeon drops and then upgrade it with other materials.